The second volume of an exciting new series exploring global theology. Though the global center of Christianity has been shifting south and east over the past few decades, very few theological resources have dealt with the seismic changes afoot. The Majority World Theology series seeks to remedy that lack by gathering well-regarded Christian thinkers from around the world to discuss the significance of Christian teaching in their respective contexts. 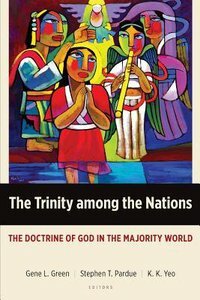 The Trinity among the Nations focuses on Christian understandings of the character and work of God in various contexts. The contributors highlight global trends in trinitarian theology in relation to historic Christian confessions, especially the Nicene Creed, and draw out the rich implications of the doctrine of God for the church and Christian living today. About "The Trinity Among the Nations: The Doctrine of God in the Majority World"
Gene Green (PhD University of Aberdeen) has been Professor of New Testament at Wheaton College since 1996. He spent thirteen years in Latin America (Dominican Republic and Costa Rica) before coming to Wheaton providing abundant opportunity to learn how to read another culture. His published works and research include 1 & 2 Thessalonians. Pillar Commentary Series; 1 y 2 Tesalonicenses Editorial Portavoz; 1 Pedro y 2 Pedro. Comentario Bblico Hispanoamericano; 2 Peter and Jude Baker Exegetical Commentary on the New Testament; The New Testament in the World of Antiquity and The Theology of Peter (New Studies in Biblical Theology). khiok-khng Yeo holds the Harry R. Kendall Chair of New Testament Interpretation at Garrett-Evangelical Theological Seminary.